Several of the most frequently utilized dermatologic treatments—especially for conditions that arise in primary care and thus may be found on the dermatology portion of the Internal Medicine board and medical school shelf exams—belong to the topical corticosteroid category. As there are dozens of options of various strengths, preparation, and container sizes (along with the consideration of whether patients prefer generic vs. brand, over-the-counter vs. prescription), it can be extremely overwhelming to select the “correct” topical corticosteroid. Fortunately, in most instances, there is more than one reasonable treatment option that will provide the patient with the relief they need. Let’s begin by reviewing 5 Dermatologic pearls that will be helpful in your clinical practice and may also help you select a couple more correct answers on the ABIM board exam. Pearl #1: Know the different strengths of the topical corticosteroids. 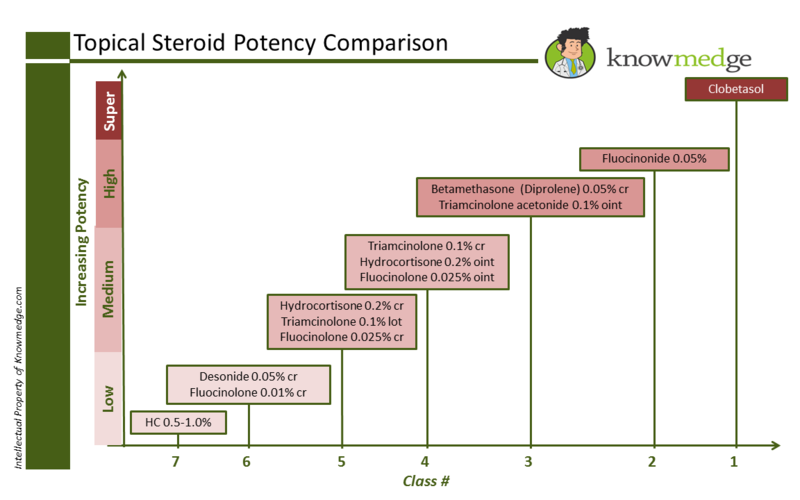 There are a total of 7 different classes of topical corticosteroids, with class 1 representing the highest potency and class 7 representing the lowest potency. It’s critical to be able to recognize the medication’s potency because we need to find the best match for the patient’s condition—strong enough to treat the disease but gentle enough to avoid unnecessary side effects. In Knowmedge fashion, here’s a slide that gives the most commonly used topical corticosteroids with their class number and relative potency. Class 1 and 2 topical corticosteroids should never be prescribed on the face of body folds or groin as these areas have more fragile skin that can be damaged by the skin-thinning potential of these stronger topical agents. Pearl #2: When pressed for time, consider these selections. For treating non-folded trunk and extremities, Triamcinolone 0.1% is a good option. For treating the face and body folds (e.g. axilla, groin, inframammary areas, panniculus), Desonide or Hydrocortisone can be used. For the palms and soles, Fluocinolone or Clobetasol may be tried. Once you think you have the right medication selected, you may pause when asked by your electronic prescription-ordering system or your local pharmacist which preparation you are ordering: cream, ointment, or lotion. 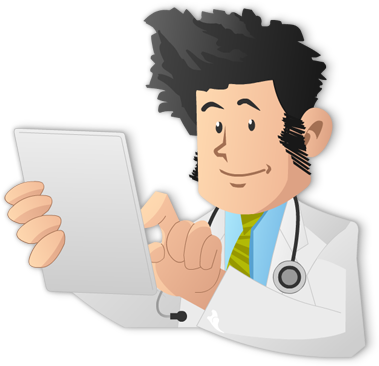 Make sure that the patient has been consulted about their preferred preparation since they may not be adherent with the treatment plan if they find it makes them feel uncomfortable. From a cosmetic acceptance standpoint, creams tend to be an acceptable option since they absorb well and lack the greasy texture of ointments. However, keep in mind that they may sting if applied to open areas of the skin and they can contain preservatives that can lead to an allergic contact dermatitis. Ointments usually contain petrolatum, which provides more of an emollient effect to help retain water. They are less likely to sting than creams. The biggest issue is the greasy texture that some patients find uncomfortable. Lotions are more water-based than oil-based. As a result, they are easily absorbed into the skin and spread easily, making them a good choice for covering large areas of the body. Unlike the straight-forward exercise of selecting the quantity of oral medications—90 days of a once daily medication equals 90 pills—providing enough topical agent to last a patient until the next scheduled refill is a bit more challenging. If too little is prescribed, they will be frustrated by frequent trips to the pharmacy, not to mention the high co-pay they may be dishing out each time they visit. A good rule of thumb to use is that 1 palm is 1% of the body when estimating the % of the skin that is affected by the patient’s dermatologic condition. Most topical corticosteroids come in 30 to 60 gram tubes. For a typical 70-kg patient, a 30gram tube provides one application to the entire body. Atopic dermatitis and xerosis may not resolve despite topical corticosteroids if patients continue to add agents to their skin which can increase drying. Harsh body washes and soap and laundry detergents can do a number on the skin. Tell patients to avoid those and instead apply emollients, which consist of water-supplying moisturizers (e.g. coconut oil, mineral oil) and water loss-reducing occlusives (e.g. petroleum jelly). Dr. Sheila Krishna is currently Chief Resident of the Department of Dermatology at the Medical College of Virginia/Virginia Commonwealth University Health System. She is interested in complex medical dermatology and general dermatology.